Elon’s very first library was a far cry from the libraries of today. It wasn’t even a separate building like Carlton, McEwen, or Belk Libraries. According to George Troxler, in his book From a Grove of Oaks: The Story of Elon University, “…the library and reading room occupied two adjoining rooms on the second floor of the college building.” It served the college for thirty-three years, from 1890 to 1923. Along with most of the college’s book collection, both rooms in the Old Main Administration Building were incinerated in the 1923 fire that destroyed this building. Little is actually known about these two rooms; one photograph of them exists. 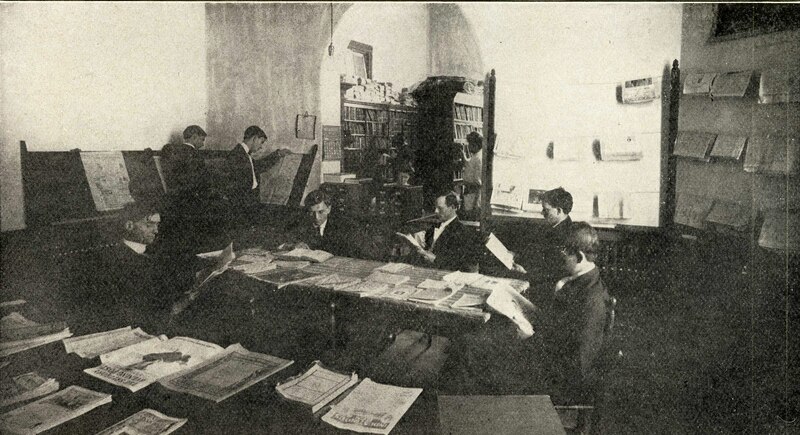 It shows a view of the Reading Room, with students reading various magazines and newspapers; other periodicals are seen on the table in the foreground. One can gather from this picture that the Reading Room was a popular place to go in Elon’s early days. In the background of the photograph is the entrance to the adjoining Library, where part of the book collection is visible. Early issues of the Bulletin of Elon College describe the two rooms separately. The 1907 Bulletin states that “The College has a well-selected Library” and that carefully selected books were added every year. It also states that the “accommodations are being constantly improved, making this one of the most enjoyable and profitable features of the Institution.” Some of the original book collection was no doubt inherited from Graham College. In the days before the Internet, even before radio and television, people found out what was happening in the world through magazines and newspapers. So the Reading Room was where Elon students and professors could read the latest issues of various weekly and monthly publications. The 1907 Bulletin describes this room: “In addition to the Library, the College maintains an excellent Reading-Room, supplied with the best magazines, weekly and daily journals, which keep students in touch with the current thought and issues of the day.” Durward Stokes, the author of Elon College: Its History and Traditions, describes the Library renewing subscriptions to a number of popular magazines in 1894, including St. Nicholas, Cosmopolitan, and Century. Other publications included Harper’s Weekly, Harper’s Monthly, Arena, Forum, Homiletic Review, North Atlantic Review, London News, Ladies’ Home Journal, New York Herald, Atlantic Constitution, Chautaugua Independent, Sunday School Times, Youth’s Companion, Literary Digest, Quarterly Journal of Economics, and The Nation. The 1907 Bulletin goes on to say, “The Reading-Room is open two hours each day.” This is a far cry from Belk Library today, which is open twenty-four hours a day, five days a week during the academic school year. In Elon’s earliest years, the Library and Reading Room were supervised by the Curator of the Library, which was an appointed Elon faculty member. This changed in 1906; according to Troxler, Elon hired Mamie Tate, Elon College’s first librarian. When Carlton Library opened in 1924, the Board of Trustees accepted a recommendation to hire the college’s first professionally trained librarian, Louise Savage who was also Dean of Women. Sadly, very little else is known about the Reading Room and Library. Most of the book collection was destroyed in the 1923 conflagration. A few volumes that were checked out survived; these books, along with donations, became the nucleus of the collection in Carlton Library. Some of the books that survived the fire are currently on display in Belk Library on the first floor. This entry was posted in Academics, Campus buildings, Campus Spaces, General Elon History. Bookmark the permalink.